We present a new exploration of the cosmic star-formation history and dust obscuration in massive galaxies at redshifts 0.5<z<6. We utilize the deepest 450 and 850μm imaging from SCUBA-2 CLS, covering 230 sqarcmin in the AEGIS, COSMOS and UDS fields, together with 100-250μm imaging from Herschel. We demonstrate the capability of the T-PHOT de-confusion code to reach below the confusion limit, using multi-wavelength prior catalogues from CANDELS/3D-HST. By combining IR and UV data, we measure the relationship between total star-formation rate (SFR) and stellar mass up to z∼5, indicating that UV-derived dust corrections underestimate the SFR in massive galaxies. We investigate the relationship between obscuration and the UV slope (the IRX-β relation) in our sample, which is similar to that of low-redshift starburst galaxies, although it deviates at high stellar masses. 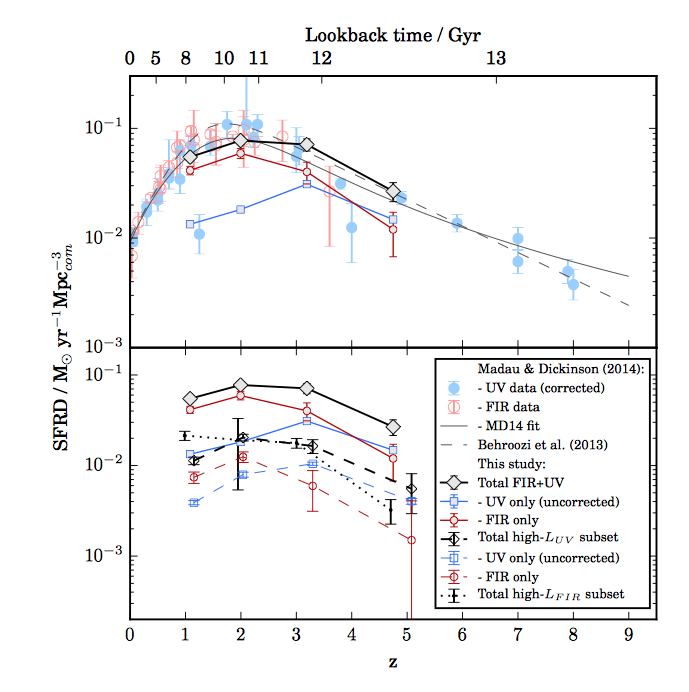 Our data provide new measurements of the total SFR density (SFRD) in M∗>1010M⊙ galaxies at 0.5<z<6. This is dominated by obscured star formation by a factor of >10. One third of this is accounted for by 450μm-detected sources, while one fifth is attributed to UV-luminous sources (brighter than L∗UV), although even these are largely obscured. By extrapolating our results to include all stellar masses, we estimate a total SFRD that is in good agreement with previous results from IR and UV data at z≲3, and from UV-only data at z∼5. The cosmic star-formation history undergoes a transition at z∼3−4, as predominantly un-obscured growth in the early Universe is overtaken by obscured star formation, driven by the build-up of the most massive galaxies during the peak of cosmic assembly. Evolution of the comoving cosmic star-formation rate density (SFRD) of the Universe with redshift (z) or lookback time. Both panels show the total SFRD (black solid lines), the unobscured portion from the rest-frame UV data (blue), and the obscured portion from the FIR (red). The lower panel also shows the contribution from the UV-luminosity-limited sample (Muv<M*; black dashed lines), broken down into unobscured (blue dashed) and obscured (red dashed); and the contribution from 450-micron-detected sources (black dotted line), which are almost completely obscured. In the upper panel, pastel coloured symbols represent results from the literature compilation by Madau & Dickinson (2014) from rest-frame UV data (blue solid symbols) and FIR data (pink open symbols). These have been converted from a Salpeter IMF to a Kroupa IMF by multiplying by 0.61. Thin solid and dashed lines represent the best-fitting models to the data compiled by Madau & Dickinson (2014) and by Behroozi et al. (2013b) respectively (also scaled to a Kroupa IMF). Our data provide new precise measurements of the obscured SFRD at higher redshifts than previous FIR measurements (pink circles), but also confirm the accuracy of existing UV measurements with FIR-free dust-corrections at z>4 (pale blue circles). We reveal a transition from a predominantly unobscured early Universe at z>4 to a Universe dominated by obscured star-formation at z=1-3 (comparing blue and red solid lines), coinciding with the rise of the most massive star-forming galaxies during the peak of the cosmic SFRD.